So I unintentionally took a little hiatus over the weekend... sorry about that. It was a busy weekend for me for my "day job" and unfortunately my stampin' job took a back seat! But I'm back and have another hand-stamped gift idea for you today... do you have any holiday parties to go to in the next couple of weeks? Probably, right? One of the things I love to bring my hostesses is a cute little package of Christmas tags. I took a picture of an assortment of tags I made recently with the Shore Stampers team members. You could easily make two or three of each of these designs in one sitting and put them together in a little cello bag tied with a ribbon and it would make a great hostess gift (add a bottle of wine to that and you'll probably be the favorite guest!). These would also make great gifts for teachers, friends and/or co-workers. Do you already have someone on your list that is a "Martha Stewart" all on her own? 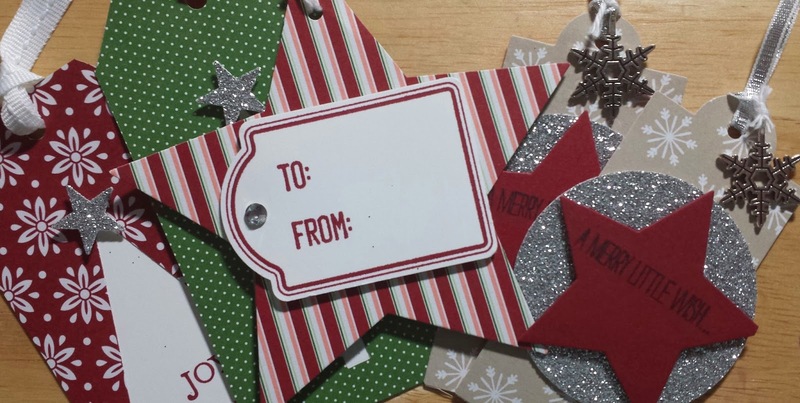 One of my new favorite products from Stampin' Up is the tag topper punches... they make creating tags so, so easy and would be a great gift! We have two different styles (and a new style coming out in the Occasions catalog!) and at just $22 each they are a great price point for a gift. You can see the scalloped edge topper here and the angled tag topper here.